Currently on display in the Archives and Special Collections Reading Room are items from the Leonard Dreyfuss papers, 1786-1972 (bulk 1931-1972), Mss 0001. Leonard Dreyfuss was a resident of Newark and the city’s Outstanding Citizen of the Year in 1942. A businessman in advertising, Dreyfuss was also very active in war efforts on the home front during World War 2, and continued his civil defense involvement after the war. The United States Civil Defense was a non-military organization created to prepare and educate Americans on potential military attacks. Their purpose was to create and inform civilians of evacuation plans, fallout shelters and routes, survival skills, and alerts. 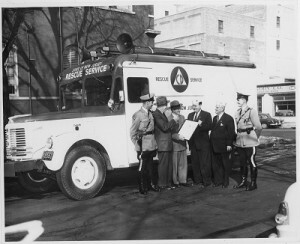 Local chapters of Civil Defense created newsletters, passed out pamphlets, and held demonstrations and test alerts so citizens would be prepared. Leonard Dreyfuss was heavily involved with the organization’s activities in New Jersey, particularly in Newark, and served on the Governor’s Civil Defense Advisory Committee during the 1950s. 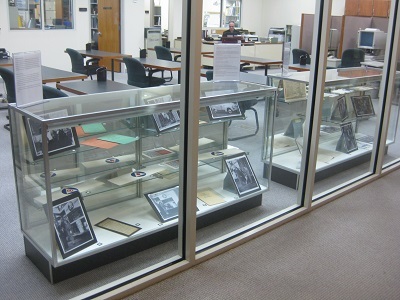 Items on display include materials related to Civil Defense activities in New Jersey, including photographs and newsclippings, and items published or distributed by Civil Defense, including pamphlets, armbands, and a poster. These items demonstrate the kind of organized efforts made by local citizens to prepare for conflict. During the Second World War, Americans were concerned with supporting the war effort and about the possibility of the conflict suddenly coming to American soil; after the war, nuclear war and weapons of mass destruction became a major concern for most Americans. The materials on display reveal one aspect of how local people tried to address those concerns and prepare for the worst. How do you see these activities and materials from the 1940s-1960s, and how does that compare to similar concerns today? How do you think people deal with fear of conflict at home, and do you think it has changed over time? View the materials on display and get a historical perspective! These items will be on display through November, 2013. Special thanks go to Lucia Alvarez, intern at the Archives and Special Collections Center, for putting much of this display together.